As the Champions Cup is still fresh in everyone’s mind, the WSK is already back on track this weekend for the start of the Super Master Series. With three categories for 194 drivers entering Round 1, the tarmac of the Adria International Raceway is about to overheat again for the next four days! 306,Tohum Arthur(N/A),Htp kart team(KART-REPUBLIC/IAME/VEGA), Adria, 27 January 2019. WSK Champions Cup, © 2019, Alexandros Vernardis / The RaceBox. 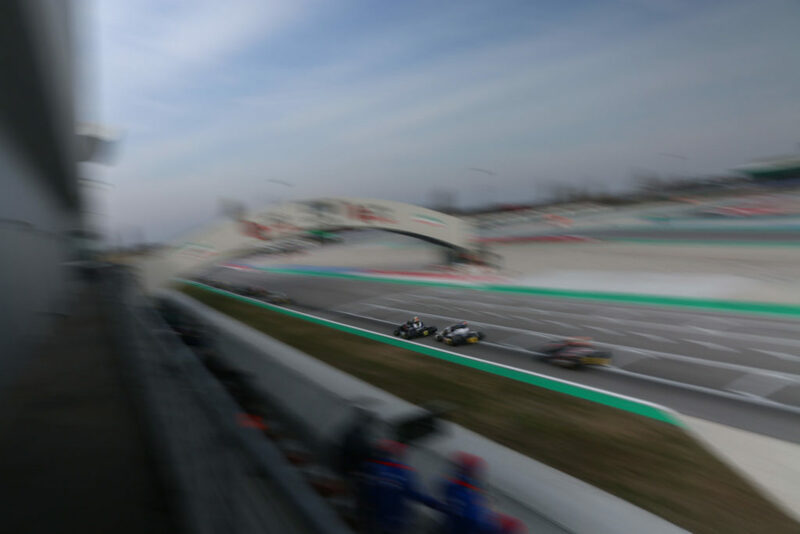 Just a few days after staging the Champions Cup to mark the official start of the WSK 2019 season, the 1.3-kilometer circuit founded in 2014 near Rovigo is already focusing on the opener of the Super Master Series, the first of 4 rounds that will take teams and drivers to some of the most-prestigious karting locations in the whole Italian peninsula including Lonato, La Conca and Sarno. Entry List: who to watch? With 194 drivers representing almost 30 countries, the entry list for this first round of the year doesn’t lack its fair share of big names in each of the three categories on track: OK, OK Junior and 60 Mini. The usual five engine manufacturers, TM, Vortex, IAME, LKE, and Modena, will be represented and tires will be provisioned by Vega (60 Mini, OKJ) and Bridgestone (OK). Starting with the 60 Mini, Andrea Filaferro (Tony Kart/TM) will be one of the youngsters to keep an eye on after his win in the Champions Cup where he kept control of his Final in impressive fashion. Second and third, Francesco Marenghi (Tony Kart/TM) and Rashid Al Dhaheri (Parolin/TM) will be aiming to repeat a similar performance one step further, as unfortunate Russian driver Maksim Orlov (Parolin/TM) will try to overcome the mechanical bad luck that left him without a potential podium finish on Sunday. Let’s not forget about other fast names like Belgians Ean Eyckmans (Parolin/TM), 7th in Adria last weekend, and Douwe Dedecker, who kept a hight level in the Heats before a engine problem in the Prefinal B shut his hopes of accessing the Final A, Jamaïca’s Alex Powell (Energy/TM), more than willing to keep his winning momentum from last year’s Final Cup, or the Brit Coskun Irfan (Parolin/TM), who had crushed the opposition in last Saturday’s Heats before suffering from a DNF in the Final. In OK Junior, the battle witnessed at the Champions Cup between Kart Republic, Ricky Flynn Motorsport and Forza Racing could be worth its weight again this weekend. If the latter team had the upper hand with Alex Dunne (Exprit/TM) and Arvid Lindblad (Exprit/TM) on Sunday, revenge will be in the air for Thomas Ten Brinke (FA Kart/Vortex) and Andrea Kimi Antonelli (KR/IAME) who both could have dreamt of a podium before a late attempt from the Italian opened the door to Lindblad. Leader of the Heats on Saturday, James Wharton (FA Kart/Vortex) couldn’t convert the next day but is among those to keep under close surveillance. 10th at the flag from 20th on the grid in Adria, newcomer Brando Badoer (Parolin/TM) could also have a say if all conditions are met. Finally, the battle for the win in OK promises again to meet everyone’s expectations. As the victor of both the WSK Final Cup-OKJ of last November and the recent Champions Cup-OK, Taylor Barnard (KR/IAME) has started 2019 on a high note. But the Rosberg Racing Academy’s member will have to keep an eye above his shoulder for drivers like Gabriele Mini’, second in Adria, Cristian Comanducci, third, Dilano Van’t Hoff (Exprit/TM), fifth, or Luigi Coluccio (Birel ART/TM), who will start his WSK season this weekend, a couple of months after finishing third at the FIA Karting World Junior Championship in Sweden. Other strong names who couldn’t perform at their finest last Sunday will be in the mix. It was the case of 2017 World Junior Champion Dexter Patterson (KR/IAME), third on the final grid but forced to a DNF, Harry Thompson (FA Kart/Vortex), fastest of them all on Saturday but caught in a first lap incident, or Lorenzo Travisanutto, whose retirement in the Prefinal A condemned to a recovery race from the back of the grid. Click here to download the full entry list (OK, OKJ, 60 Mini). The usual Qualifying practice will open the program this Thursday. A total of 31 Heats will keep drivers busy on Friday, February 1st, and Saturday, February 2nd, to lead to the closing day. The program of Sunday, February 3rd, will kick off with the six Prefinals for OK, OK Junior and 60 Mini before two Final Bs for OK Junior and 60 Mini where all drivers that could not qualify for the Final will have one more chance to challenge each other. Finally, the ultimate showdowns for each class will start from 14:00 (see schedule below). To help you follow the Round 1 of the WSK Super Master Series, a special page will be published on this website with day-to-day Live timing (brought to you by Apex timing), then with Live Streaming (provided by WSK Promotion) on Sunday for the Prefinals, Finals B, and Finals. Daily reports will also be published on this website with results and exclusive photos taken on location. Check out also The RaceBox on Facebook, Twitter, and Instagram.